B.B. King (born Riley B. King; September 16, 1925 – May 14, 2015) was an American blues guitarist and singer-songwriter. Rolling Stone magazine said that King was the third "Greatest Guitarist of All Time" in 2003. He was born in Indianola, Mississippi. His father left the family and his mother was too poor to raise him, and so he came to his grandmother, Elnora Farr, in Kilmichael, Mississippi. There he sang in the gospel choir at Elkhorn Baptist Church. At the age of 15 he bought his first guitar. His idols were T-Bone Walker, but also jazz musicians like Charlie Christian and Django Reinhrad. 1943 he left the town and worked as a tractor driver. He performed on Sonny Boy Williamson's radio program on KWEM in West Memphis, Arkansas and reached a local audience with his sound. For this reason he got appearances in the Sixteenth Avenue Grill in West Memphis and later, a ten-minute spot on the Memphis radio station WDIA. This became so popular that it was expanded and became the "Sepia Swing Club." During his work for the radio station he got his nickname "Beale Street Blues Boy" which was later shortened to B.B. In 1949, King began recording songs for RPM Records from Los Angeles. King formed his own band; the B.B. King Review, under the leadership of Millard Lee and went on tours. In winter 1949 he played at a dance hall in Twist, Arkansas. The hall was heated by burning barrels filled with kerosine. During his performance two men started a fight knocking over one of them and the hall was burning. Outside he learned that he had left his guitar and he ran inside to get it. Next day he found out that the fight was started over a woman named Lucille. Since that time he named the guitar "Lucille." In the 1950´s B.B. King became one of the most important blues musicians. He toured regularly. In 1956 he gave 352 concerts. Among his hits were "3 O'Clock Blues", "You Know I Love You," "Woke Up This Morning," "Please Love Me," "When My Heart Beats like a Hammer," "Whole Lotta Love," "You Upset Me Baby," "Every Day I Have the Blues", "Sneakin' Around," "Ten Long Years," "Bad Luck," "Sweet Little Angel", "On My Word of Honor," and "Please Accept My Love." In the 1960 King lost importance for black listeners but could reach the white music fans. A lot of white guitarist like Eric Clapton named him as influence. King played at rock concerts and venues of the hippie culture like the Fillmore West. He also reached #15 in the US-popcharts with his title "The Thrill Is Gone". From the 1980s onward he had continued his career, appearing on numerous television shows and performing 300 nights a year. The title "When Love Comes To Town", which he performed together with the rock band U2 introduced him to a younger audience. B.B. King was married two times. The marriages ended because of the burden of more than 200 concerts a year. It is reported that he is father of 15 children. He has lived with Type II diabetes for over twenty years and is a high-profile spokesman in the fight against the disease. King died at the age of 89 in Las Vegas, Nevada on May 14, 2015 from complications of Alzheimer's disease along with congestive heart failure and diabetic complications. On May 30, 2015, King's funeral was held at the Bell Grove Missionary Baptist Church in Indianola, Mississippi. He was buried at the museum. B.B. King has made guest appearances in numerous popular television shows, including The Cosby Show, The Young and the Restless, General Hospital, The Fresh Prince of Bel-Air, Sesame Street, Married... with Children, Sanford and Son, and Touched by an Angel. He has also made a cameo in the movie Spies Like Us. In the movie Blues Brothers 2000 he was the leader of The Louisiana Gator Boys, a bluessupergroup, which battles against the Blues Brothers. He is the owner of a chain of restaurants with concert venues in the United States. The first was opened on Beale Street in Memphis 1991. In 1980, he was inducted into the Blues Hall of Fame. In 1987, he was inducted into the Rock & Roll Hall of Fame. In 1990, he was awarded the National Medal of Arts. In 1991, he was awarded the National Heritage Fellowship from the NEA. King was awarded the Kennedy Center Honors in 1995. This is given to recognize "the lifelong accomplishments and extraordinary talents of our nation's most prestigious artists." In 2004, the Royal Swedish Academy of Music awarded him the Polar Music Prize for his "significant contributions to the blues". On December 15, 2006, President George W. Bush awarded King the Presidential Medal of Freedom. On May 27, 2007, King was awarded an honorary doctorate in music by Brown University. On May 14, 2008, King was presented with the keys to the city of Utica, New York; and on May 18, 2008, the mayor of Portland, Maine, Edward Suslovic, declared the day "B.B. King Day" in the city. Prior to King's performance at the Merrill Auditorium, Suslovic presented King with the keys to the city. In 2009, Time named B.B. King #3 on its list of the 10 best electric guitarists of all time. Each year during the first week in June, a B.B. King Homecoming Festival is held in Indianola, Mississippi. A Mississippi Blues Trail marker was added for B.B. King, commemorating his birthplace. On May 29, 2010, Sabrosa Park (at the small town of Sabrosa, north of Portugal) was renamed B.B. King Park in honor of King and the free concert he played before 20,000 people. One category of the Blues Music Award of the Blues Music Foundation is called "B.B. King Entertainer of the Year "
King was given a Grammy Lifetime Achievement Award in 1987. 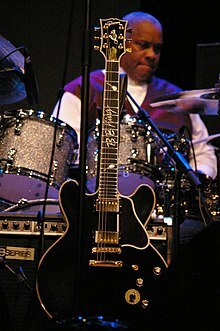 As of 2009, he has won 15 Grammy Awards, of which ten have been the Grammy Award for Best Traditional Blues Album :in 2009 (for One Kind Favor), 2005 (B. B. King & Friends: 80), 2003 (for A Christmas Celebration of Hope), 2001 (for Riding with the King), 2000 (for Blues on the Bayou), 1994 (for Blues Summit), 1992 (for Live at the Apollo), 1991 (for Live at San Quentin), 1986 (for My Guitar Sings the Blues) and 1984 (for Blues 'N' Jazz). For a complete discographie visit MusicBrainz. ↑ "Music News – Rolling Stone". ↑ 2.0 2.1 "BB King". www.jazzandbluesmasters.com. ↑ 4.0 4.1 Hear B.B. King (music and interviews) on the Pop Chronicles (1969). ↑ "Coroner: No Evidence B.B. King Was Poisoned Before Death". The Huffington Post. July 13, 2015. Retrieved July 14, 2015. ↑ "B.B. King Coroner's Report: No Evidence of Poisoning". Rollingstone.com. Retrieved July 15, 2015. ↑ Associated Press in Indianola, Mississippi (1970-01-01). "BB King's funeral draws hundreds as Obama says country 'has lost a legend' | US news". The Guardian. Retrieved 2015-05-31. ↑ "Hundreds gather to farewell BB King". Theage.com.au. Retrieved 2015-05-31. ↑ "Community news from The Centre Daily Times in State College, PA". centredaily.com. Retrieved 2015-05-31. ↑ "List of National Medal of Arts Recipients". Nea.gov. Retrieved 2010-02-17. ↑ "1991 NEA National Heritage Fellowships". Nea.gov. Retrieved 2010-02-17. ↑ "Kennedy Center Records". Kennedy-center.org. 1925-09-16. Retrieved 2010-02-17. ↑ "List of Presidential Medal of Freedom recipients". Senate.gov. Retrieved 2010-02-17. ↑ "Brown University to Confer Nine Honorary Degrees May 27". Brown.edu. Retrieved 2010-02-17. ↑ ""The Blues Heritage" Indianola, Mississippi Chamber of Commerce". Indianolams.org. Retrieved 2010-02-17. ↑ Mississippi Blues Commission. "B.B. King Birthplace". msbluestrail.org. Retrieved 2 February 2010. ↑ "Grammy Lifetime Achievement Award Winners". Grammy.com. 2009-02-08. Retrieved 2010-02-17. Wikimedia Commons has media related to B.B. King. This page was last changed on 28 February 2019, at 11:43.